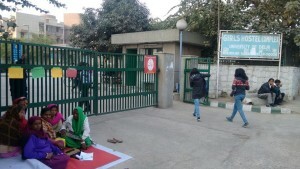 Ten Dalit safai karamcharis (8 women and 2 men) of Undergraduate Hostel for Girls (UGHG) in the Dhaka complex of University of Delhi have been on an indefinite sit-in dharna outside the hostel complex in protest against their unjust and illegal dismissal from work since 1st of January. They had been working in this hostel from 4th Oct’2012, which is when this new hostel opened as well. Last year, these women had led a militant struggle against caste discrimination by the hostel supervisor Shaina Begum appointed by the Provost Rita Kakkar. When the workers had complained to the Provost last year in July about the behaviour of the Supervisor and the casteist abuses she hurled at them, the Provost refused to take any action. The workers had hence approached the SC/ST Commission with their complaint, after which the Supervisor was removed from work and a settlement was reached on 24th Nov’15. From the next day itself the workers started hearing that the current contractor SULABH would be changed. One month later this change took place. The workers collected their monthly salary on 31st Dec. When they showed up for work the next day on 1st Jan’16, the guard had a list of 10 workers who were told that they have been dismissed from work. These were the same workers who had raised their voice against the caste discrimination they had experienced at their workplace, while 6 other workers had been retained. The University of Delhi is the prinicipal employer in this case, and this is a clear case of caste discrimination of Dalit workers by the university, even if it is trying to silence the matter by claiming its about the contractor. The workers have been targeted and ‘penalised’ by the university hostel administration for raising their voice. This is not unfamiliar to us. Hostel administrations constantly also repress voices of women students who have dissented. In the same Undergraduate Hostel for Girls, there is a rule in the official hostel rule book that disciplinary action could be taken against women residents for raising issues such as shortage of water and we have documented cases of women students who have been expelled from this same hostel, that we have submitted as complaints to the Delhi Commission for Women. Even right now, women residents are under tremendous pressure by the administration to not support the workers’ struggle and are being threatened. The conditions of work under the sub-contract of SULABH were also extremely precarious: low pay, no PF or medical leave, no pay for over-time, no health and safety regulations, no compensation for accidents at work: the list is endless. This is not unique to UGHG, women safai karamcharis across hostels are subject to similar exploitative conditions of work under increasing sub-contractualisation of work. This also reflects how the university administration reproduces the oppressive structures of patriarchy that devalues paid care and reproductive work performed by women. We stand in solidarity with the struggle of the Dalit women workers against this Brahminical patriarchal university administration that binds us in cages and shackles and constantly seeks to repress and silence any voice and effort against dismantling its oppressive regime. The struggle of the Dalit women workers in University of Delhi becomes particularly important at this juncture where students across the country are rising up in protest against the intrinsic caste violence that characterise our university spaces.